How often are you delighted with a new website you find? And how often do you click the back button to go somewhere else? With an abundance of websites and information overload, it’s not easy to enchant new web visitors. The only shop was closed. It was Thursday afternoon, half past four. Exhausted from cycling in the heat, we were longing for a shower, a snack, and a cold beer. We knocked on the door of the village hotel. We tried the back door and found it was open. We sneaked in and discovered a key and a piece of paper with Mrs Henneke – room 10 written on it. We showered and hand washed our clothes; and then waited for somebody to turn up. We had nothing to eat, just tap water to drink, and the wifi wasn’t working. Not a welcome you’d like give your visitors, huh? But that’s exactly what happens on your website, my website, and everyone else’s website. We are not around to personally greet each web visitor and guide them in the right direction. So what can you do to make weary internet travelers feel welcome? Your home page is like the lobby of a hotel. What impression do you want to give web visitors? Swanky or intimate? Friendly or business-like? Have a simple headline that tells web visitors where they’ve arrived and what to expect. Consider showing a photo to humanize your business. When Highrise included a picture of a real person, their opt-in rates increased by 102.5%. Tell people you can be trusted by displaying logos of customers, a testimonial, or logos of publications you’ve been featured in. Be clear about what you expect first-time visitors to do next. Read a popular blog post? Sign-up to your blog updates? Download a report? Scrap gobbledygook and marketing drivel because it turns customers away. You don’t want to sound like one of those hotels where a machine rather than a human checks you in, do you? De-clutter. Simplify your home page because showing a lot of options can confuse first-time visitors. Your home page tells first-time visitors where they’ve arrived (e.g. a friendly place to learn more about copywriting and blogging); and your about page tells them why they should read your blog posts or buy your services (e.g. you’re fun and know your stuff). Write what your readers want to read, not what you want to write. Tidbits about your life can make you more approachable, but nobody wants to read a long biography about you. Show your personality. Tell web visitors why they’ll enjoy reading your blog posts and why they’ll love working with you. Include an email address, because not everyone likes filling in forms. Link to active social media profiles only. Stale social media profiles make you look anti-social. Show a professional photo with a welcoming smile. Don’t chase customers away with a stern-looking picture or an overly relaxed holiday shot. Use a conversational tone. Sound like YOU. You know those folders you find in a hotel room with information about services and the surrounding area? Some are chock-full with useless advertising. Others give you just what you need (where to find the honesty bar!) plus interesting information about the village history and the hotel (Ernest Hemingway stayed here in 1924). Consider a New? Start here page to guide people around your website. Glen at Viperchill recommends articles for beginner, intermediate, and advanced marketers on his New? Start here page. Have content landing pages that show your best posts about a specific topic (like my sales copy tutorial). Hand-pick your most useful posts and list them as popular blog posts in your side bar. Internet travelers are weary, fed-up of reading long-winded copy and clicking around websites without finding what they need. 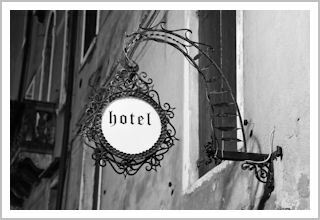 Keep your website simple, reduce options, and think about the small touches that can delight first-time visitors – like the hotel owner offering you a free bottle of water. First time online visitors most often sneak in via the back door, that is: one of the sub pages of your website, directed via a Google search. This means that your rules not only apply for the home-page of your website but in fact for all pages of your website! That’s an excellent point – online visitors are indeed sneaking in via the back door. Yeah. It sounds easy, but it’s often quite difficult. May I ask if the empty hotel was in France? I’d say your website is already fairly simple and uncluttered! But you might want to replace “recent posts” by “popular posts” (and just pick the most important posts you’d like visitors to read). And yep, the hotel was in France. Fortunately, they served us a good meal later on! I even think the hotel was fully or almost fully booked (they had 15 rooms or so). I was surprised that there wasn’t anyone to receive us. They also closed the hotel bar quite early leaving several guests outside on the terrace with a supply of drinks. Yes recent v. popular. That’s on the to-do list! Re the French hotel, I am not so surprised if it was a small village. They trust their guests, but I understand it can be disconcerting! Bit scary. This is the first blog comment I’ve ever made. I’ve been a subscriber to your posts for a little while now. I just have to say I am extremely envious of your ability to use your cycling/food/bread experiences and relate them to your advice about internet marketing. It adds life to the message and is very engaging. Not sure how but I’m hoping to be able to do the same with my new online venture. Hey Trevor – thank you so much for leaving a great comment. I feel honored that you’ve left your first blog comment here! It took me a while to develop the ability to link cycling etc to online marketing. The book that helped me develop this skill is The Tall Lady with the Iceberg by Anne Miller. Highly recommended. I think the idea of a ‘New? Start here’ page is interesting. I get a lot of hits from Google because of old blog posts. People get directed to those articles, and other than what’s on the blog sidebar or on the upper page tabs, they might not know what to do next. Perhaps it’d be good to try out for a few weeks and see what kind of traffic it gets. Kind of like a Home Page 1.5 for those just catching up. The problem with the sidebar is that it often moves to the bottom of the page when people view your mobile site, so people might not see it at all (unless they read your full post). The other thing I’ve seen people do, is include a sign-up form in the middle of a blog post. This is a pain for regular visitors who just want to read a post. However, it’s something worth considering for old blog posts that generate a lot of organic traffic – especially if you have a related report that you could give as a sign-up bonus. I’d be interested to hear what happens if you implement the ‘New? Start here’ page. Reading your article reminded me of the fact that I haven’t updated my about page in a while and it’s time to do it. As for welcoming readers, I’ve chosen to direct them to my best resources based on what they are looking to get right now (ie in my case WordPress, SEO or Analytics). PS: Hope you had a really good time in your biking trip. Like you, I need to update my about page. It’s just so hard to find time for these jobs, isn’t it? Henneke, your legs might be tired and sore, but your brain surely is energized! You have given me plenty to do in my non-existing spare time. Thanks! I can see better, now, what needs changing at my place. I owe it to you. I did think about the comment re: new visitors often do sneak in the back door. Perhaps in addition to the front page greeting the newcomers, a widget to that effect (that appears on every page) would also be appropriate? Hi Katharine – It’s been good to re-energize my brain by being outdoors & active! Yep, a widget may work when people sneak in through the back door. Do you have a particular widget in mind? What widget? Nothing fancy, just a text box with a link to the “New Here?” page. Since I’ve read this post, I’ve realized a benefit in making a change in the home page and creating a newbie page. Ah, got it. That’s a great idea! The elevator should be right behind the sales tables, eh? Excellent stuff as always, Henneke. I’ll be re-doing my website soon, and you’ve given me a few outstanding ideas here.